It was a very mixed month for world equity markets, with net monthly changes ranging from +5.3% (Japan), +0.9% (USA), to -6.2% (Brazil). There remains opportunity for another wave higher this June/July, but an intermediate correction remains an increasingly likely outcome. The Greek market traded in a rather narrow range across May, settling net higher by just 0.3% @ 825, the second consecutive net monthly gain. First resistance is the 10MA (895.. and falling). The issue of Greece is a major concern to many, but then, it has been that way since spring 2010. A GREXIT looks increasingly probable, the can kicking is surely going to come to an abrupt halt at some point this summer. The only issue is what exactly will the Greek leadership decide? A partial debt default of some degree seems likely, but the bigger issue is whether Greece would abandon the Euro and switch back to the Drachma. What should be clear to most, the 'smart money' has already exited the Greek banking system, whether to end up under the bed, to be spent in the economy, or wired into a foreign account. 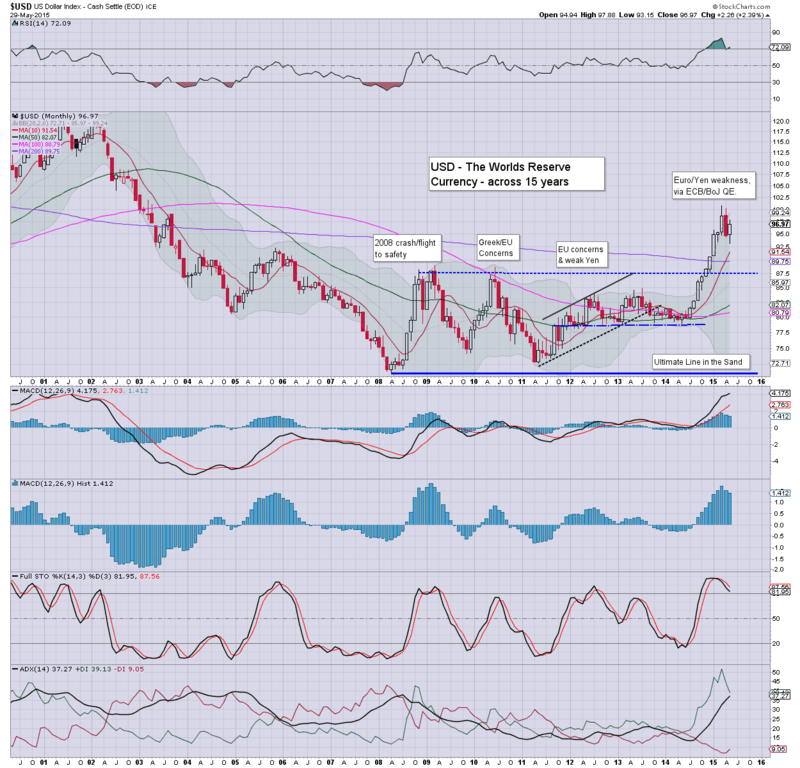 As for how the Athex might react to any kind of GREXIT... some initial weakness would seem highly probable. However, a major devaluation would eventually result in attracting new foreign capital, and given a few years, would be a major positive for the Greek economy. 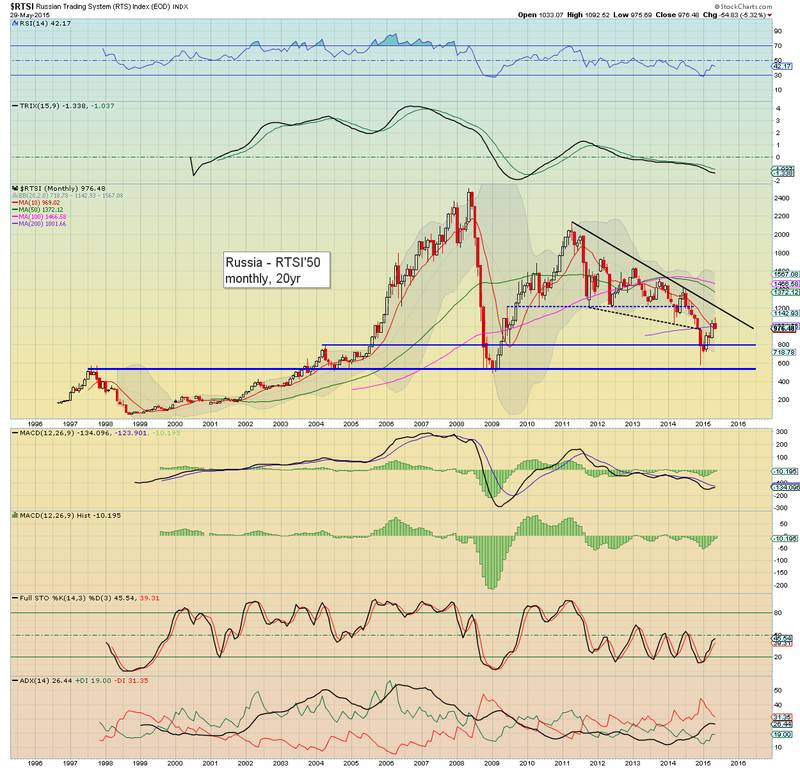 The Brazilian market saw a rather severe net monthly decline of -6.2% @ 52760, although the Bovespa did manage a higher high... along with a higher low. There is clear resistance around 59K, with key support at the 50K threshold. Broadly, the market has been stuck for five years, having been held back as commodities have broadly cooled since spring 2011. The French market saw the first net monthly decline of the year, but only lower by a moderate -0.8%. 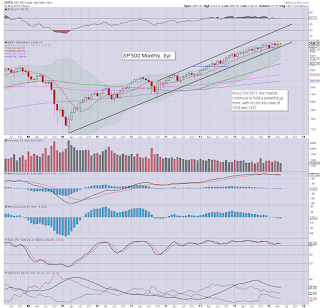 Despite the decline, it was still a monthly close in the 5000s. 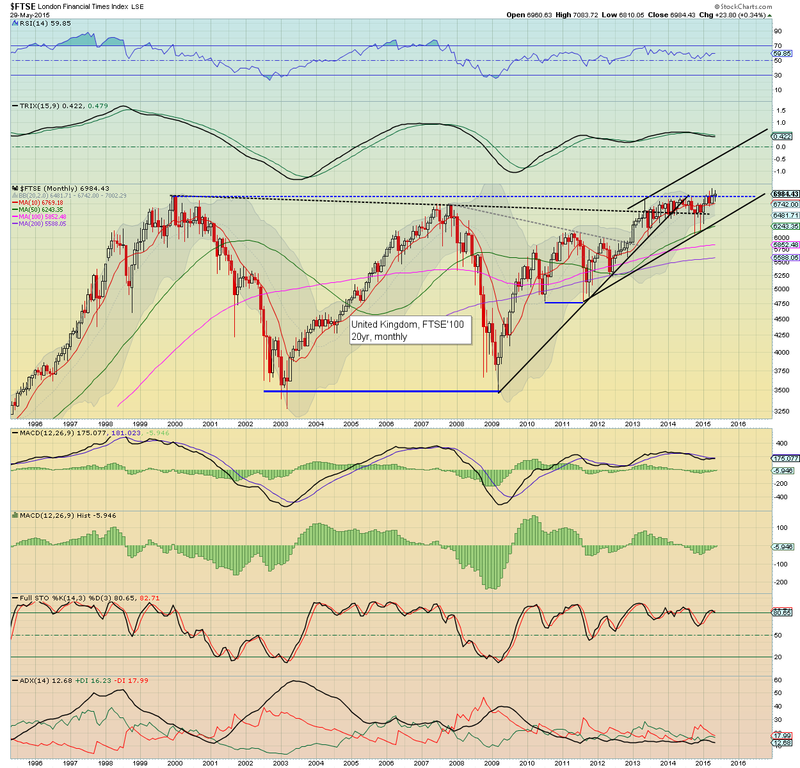 There is huge resistance in the 5200s, and the June 2007 high of 6168 looks out of range for some months. In terms of 'best case downside', there will be core support in the 4500/4250 zone into the early autumn. The economic powerhouse of the EU - Germany, saw a minor decline of -0.3% @ 11413. First support is the giant psy' level of 10K. 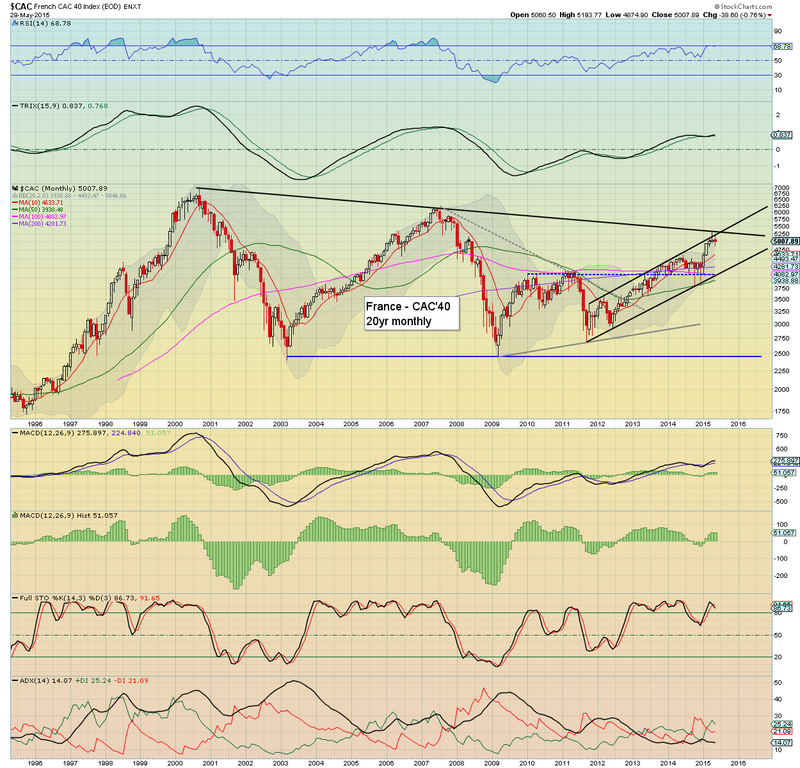 Even if most world markets are spooked later this summer/autumn, a monthly close <9K looks extremely unlikely. A minor net monthly gain of 0.3%, once again falling shy of a monthly close in the 7000s. First key support is around 6500. 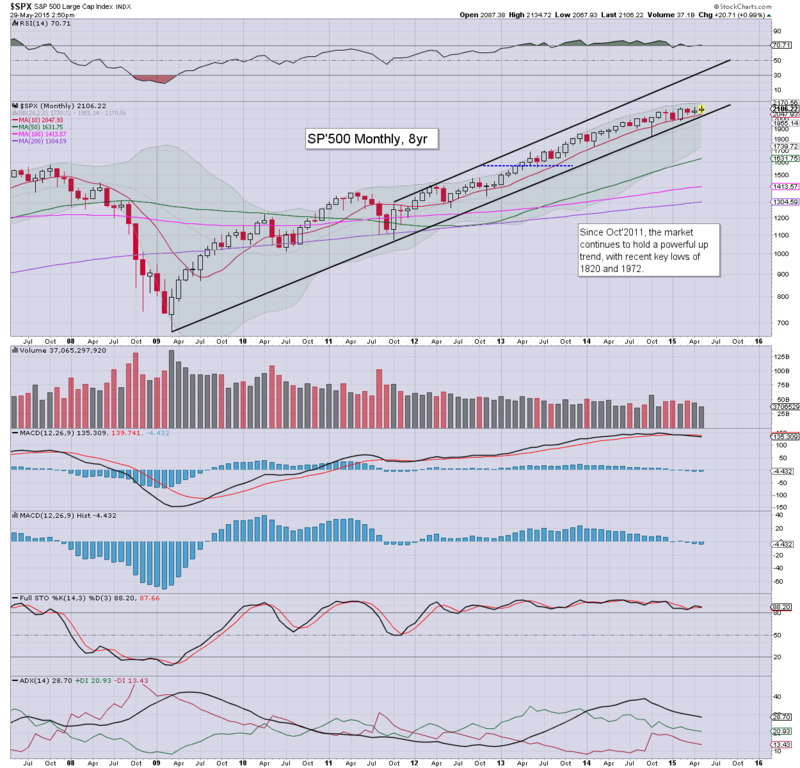 A monthly close <6K looks highly unlikely this year, with broader upside into the 8000s in 2016. The ugliest and most problematic of the EU PIIGS (due to its size) - Spain, saw a net monthly decline of a somewhat significant -1.5% @ 11217. 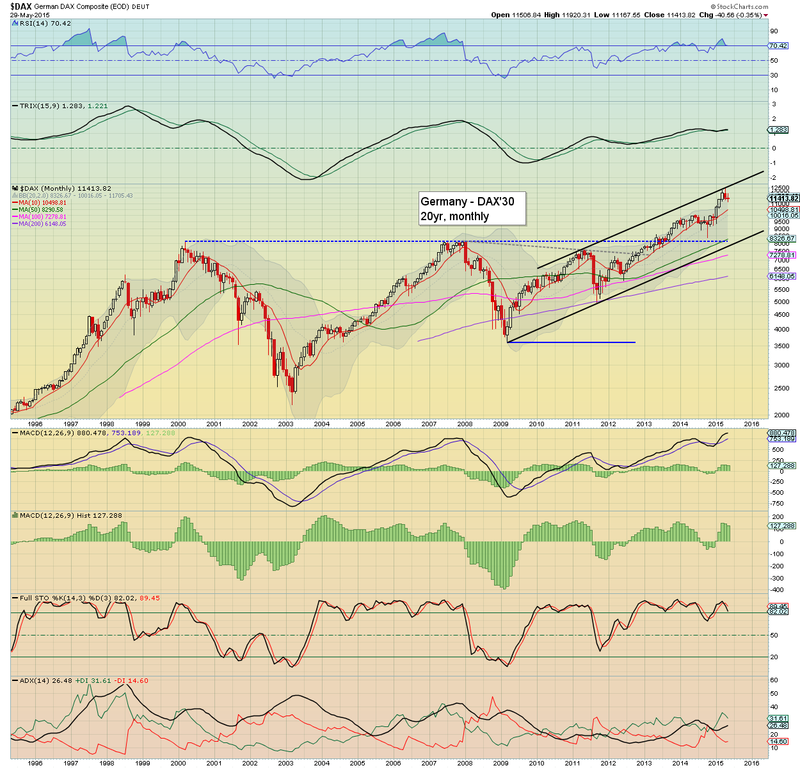 The 12K threshold remains stiff resistance, but looks set to be broken, regardless of any initial weakness this summer. 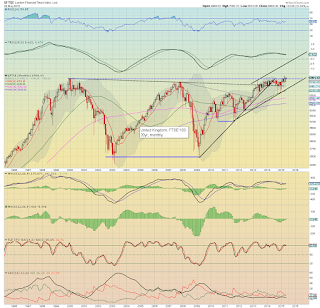 A break above 12K will open the door to challenge the Nov' 2007 high of 16040. A hyper-bullish target for 2017 would be the psy' level of 20K. 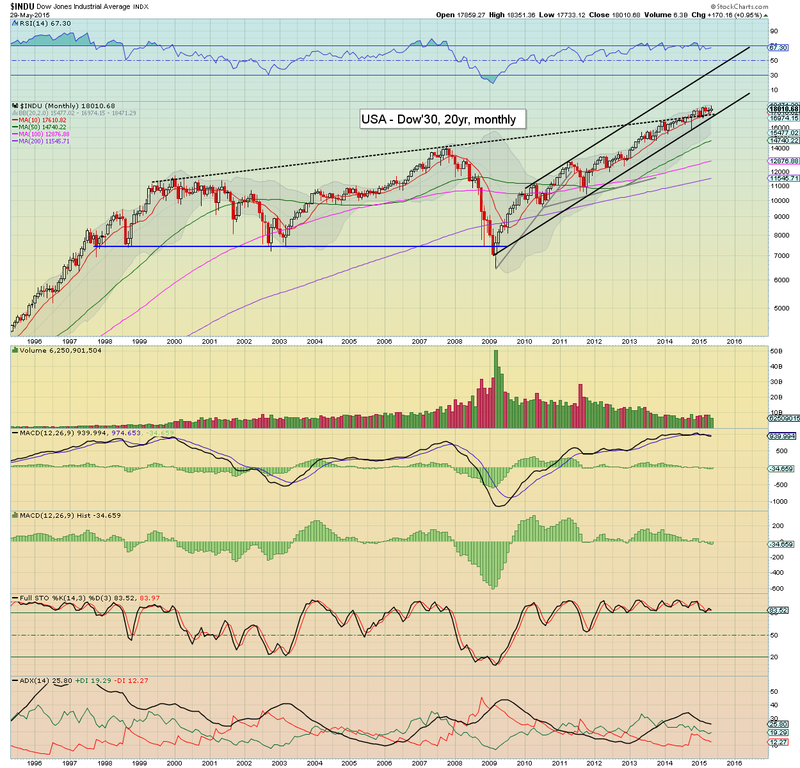 The mighty Dow gained 170pts (0.9%), having attained a new historic high of 18351. 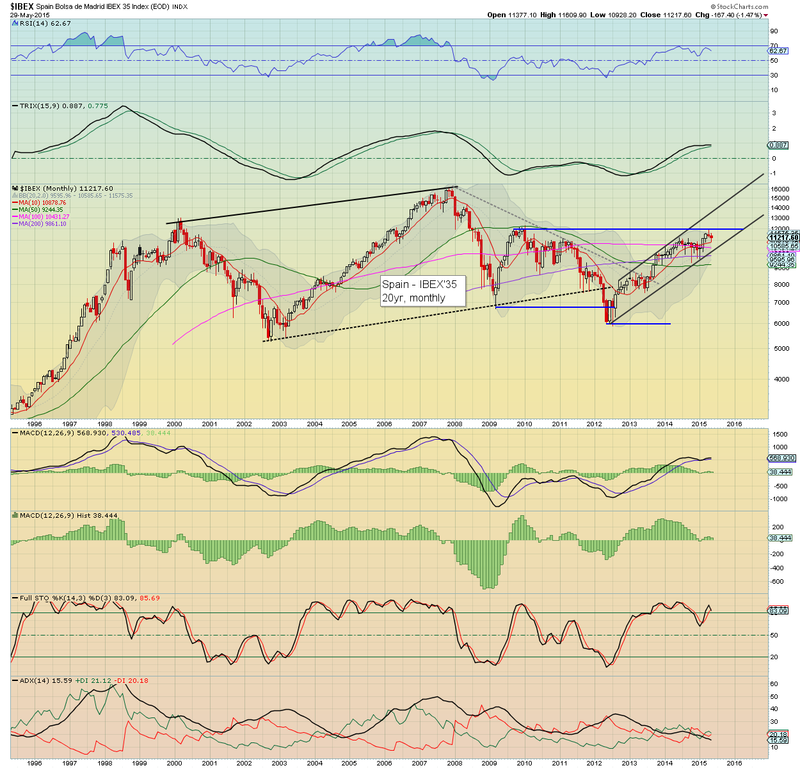 Upper monthly bollinger is offering renewed upside to around 18500 in June/July. In terms of downside, it will be very hard for the bears to break much below 16K. A year end close >20K remains very viable. 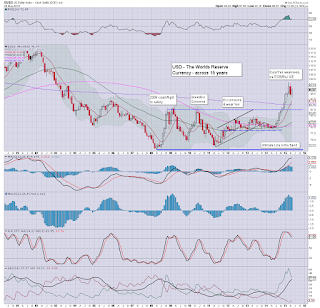 The BoJ fueled Nikkei climbed for the fifth consecutive month, with a net gain of 1043pts (5.3%) @ 20563. 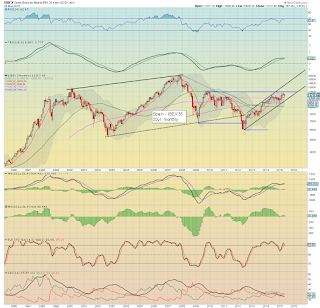 The Japanese market looks vulnerable to a brief washout down to the 17/16k zone at some point this summer/autumn. However, with continuing QE from the BoJ (and other central banks), the Nikkei looks set to climb broadly higher across the next few years. 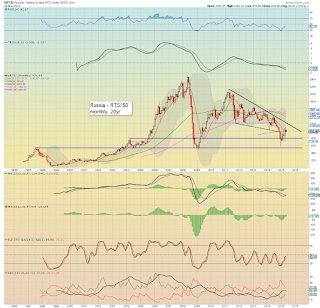 Much like the Brazilian market, Russia saw a significant net monthly decline, -5.3% @ 976. 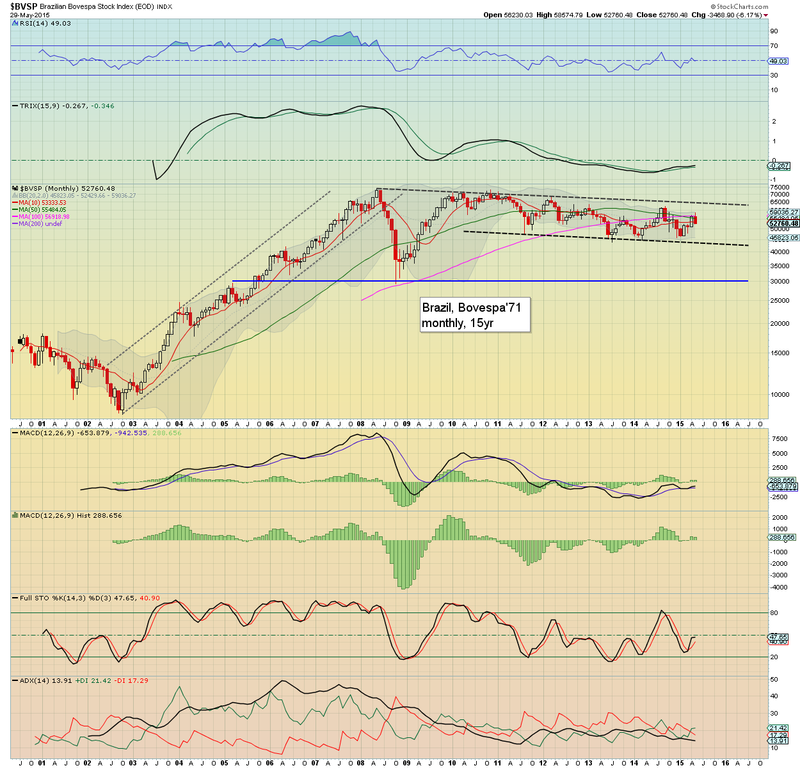 Also similar to the Bovespa, despite the decline, there was a higher high... and a higher low. There are multiple aspects of resistance in the 1000/1200 zone. All indicators remain bearish, with viable downside to the 800/700s - if other world markets see a sig' correction at some point this year. 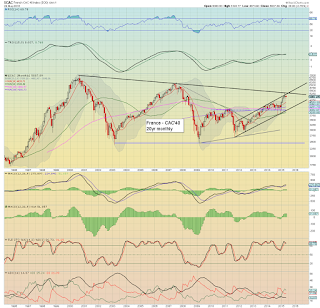 A monthly close in the 1200s would bode for much higher levels in 2016. First target would be the 1500/1600 zone... and then the big 2K level. Certainly, 2K looks well out of range this year, as energy prices look close to maxing out. The China market remains in hyper-bullish mode, with a net monthly gain of 3.8% @ 4611, having hit 4986 just a few days previously. Volatility is starting to increase again, as the market is challenging the psy' level of 5K. If 5K is not broken above in June/July.. natural downside would be a retrace to the breakout zone in the 3400s.. which is a long way down. 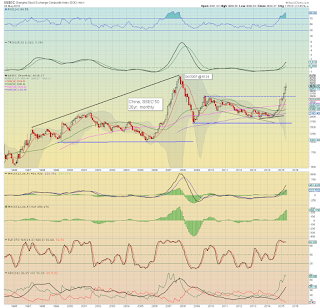 Broader hyper-upside to 8-10K looks viable within the next two years. It was a bit of a mixed month for world equity markets. 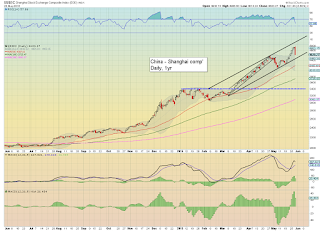 We're still seeing some powerful strength in Asia, but some of the EU markets are clearly getting stuck at resistance. Most markets are long due a significant correction, and all have viable downside of 10% or so. Yet... the next wave lower will likely disappoint most equity bears.. and the declines will be swiftly reversed. 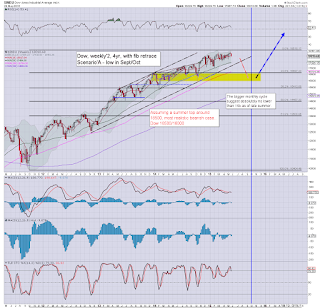 Right now, even a correction on the scale of Oct'2014 (sp'500 -9.8%) looks a bold target. In terms of the Dow, the following remains a primary scenario. Considering the ongoing QE from various central banks and low rates, equities remain the only viable place for most money to go. At best this summer, the Dow might fall to 16K. 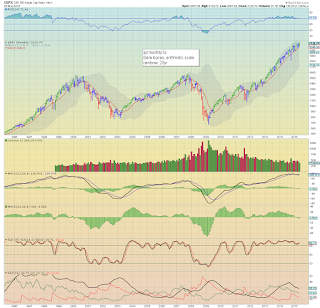 I do not believe we'll see a grand multi-year top of this ramp from 2009 for another two years. That will likely apply to most world equity markets.. although not all. A pretty busy week is ahead, not least with the monthly jobs data, and a key OPEC meeting. The month of May saw some interesting action in the US capital markets. The USD rebounded by 2.4%, which certainly put some downward pressure on Copper (-5.3%), with WTIC Oil (+0.9%), settling at the $60 threshold. US equities saw broad gains (sp'500 +1.0%), but with notable weakness in the Transports, -3.4%. 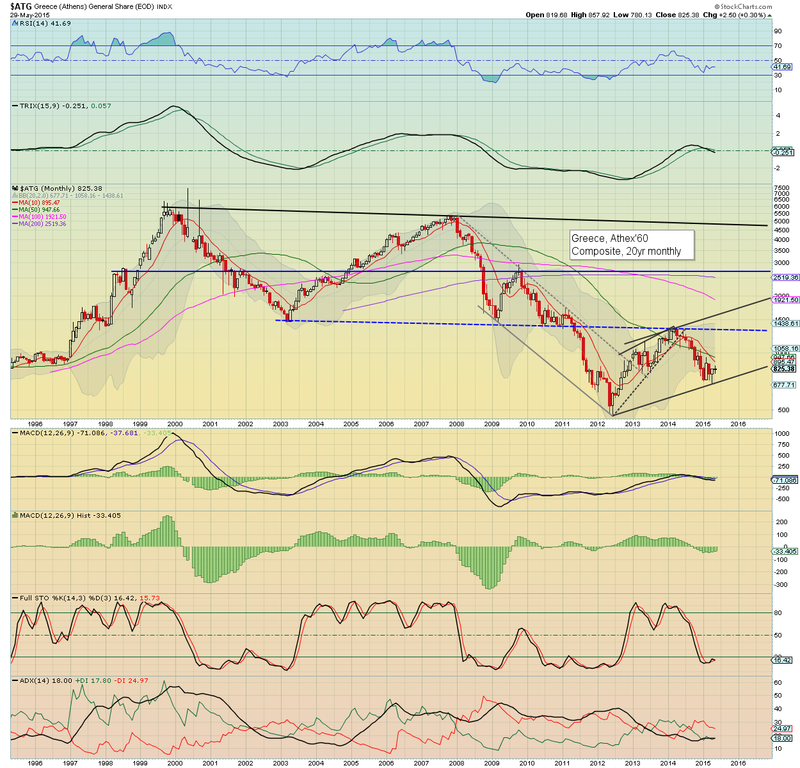 A rather significant net monthly gain of 2.4%, having swung from the DXY 93s to upper 97s. Underlying MACD (blue bar histogram) remains on the high side, and there remains threat of another month or two of cooling, before breaking new highs >100.7. Broadly... the DXY 120s look a given, the only issue is whether that is possible late this year.. or not until 2016. 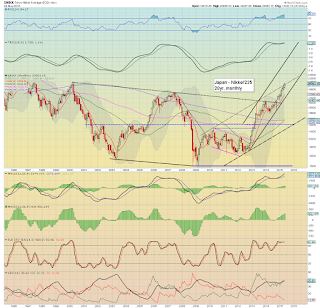 Very difficult to say... except that the broader trend is unquestionably bullish. After a new cycle high of $62.58, WTIC Oil cooled a little, settling net higher by just 0.9% @ $60.30. There still looks to be viable upside in June/July to 65/67.. not least if the USD cools back lower. Sustained price action in the $70s looks unlikely for rest of this year, as OPEC look set (Friday, June 5th') not to cut supply. 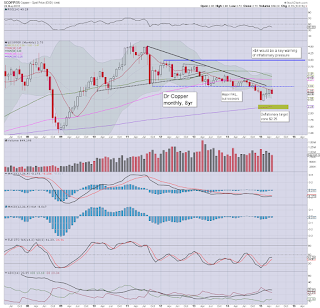 The multi-month up wave has concluded, with Copper seeing a net monthly decline of -5.3% @ $2.73. 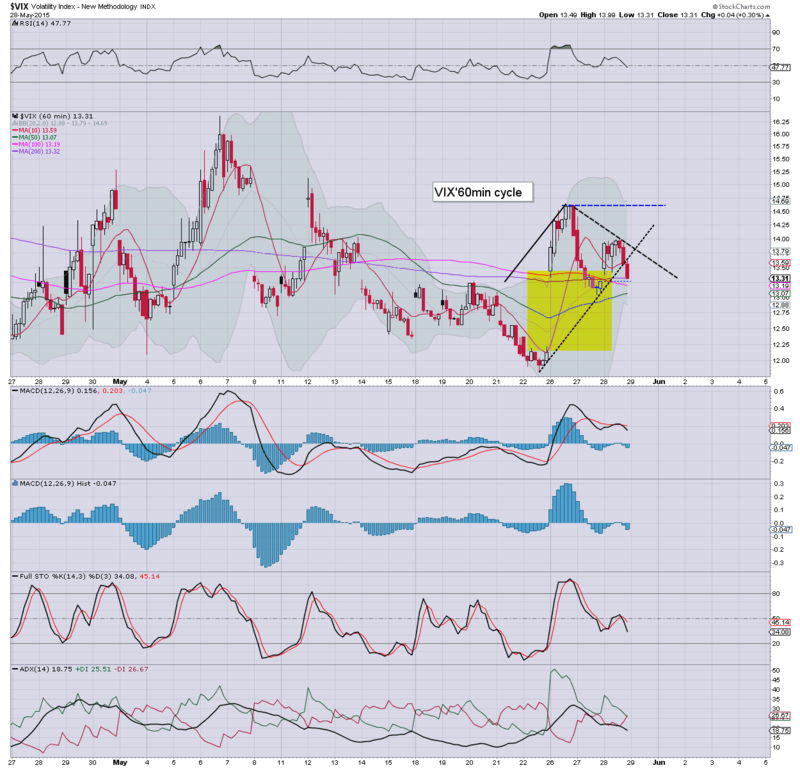 The low $2s look due in the coming months. 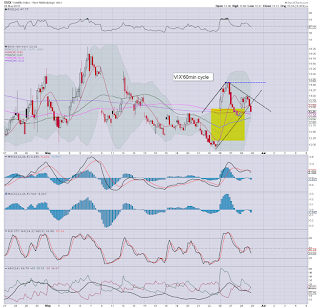 If correct, that would bode bearish for Gold/Silver.. along with the related mining stocks. 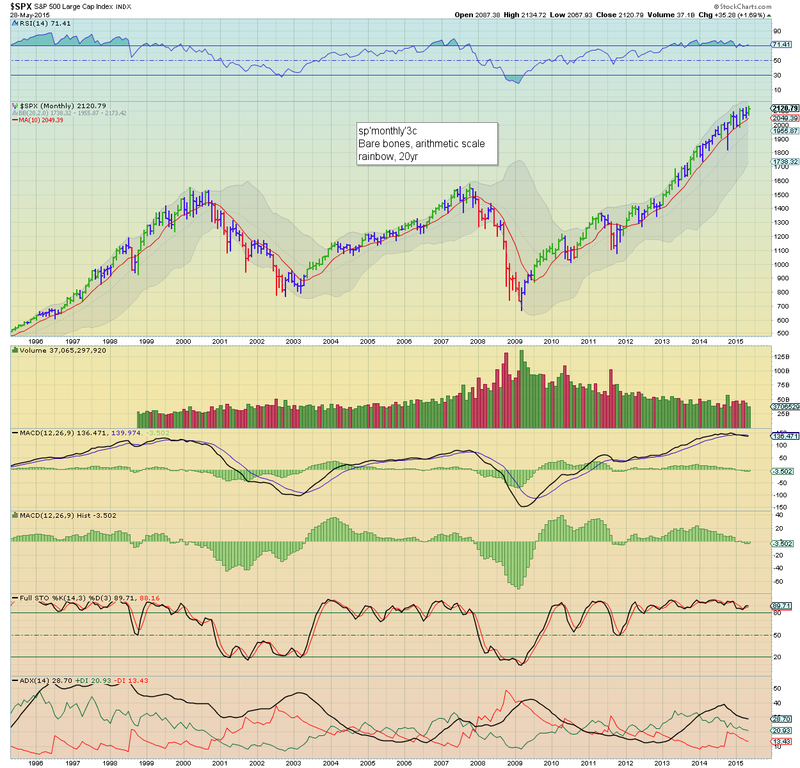 A net monthly gain of 21pts (1.0%), having hit a new historic high of 2134. Underlying MACD (blue bar histogram) remains negative cycle, as momentum slowly swings back to the bears. 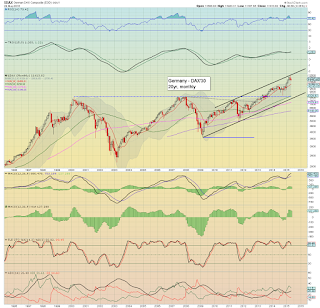 The upper monthly bollinger is offering the 2170s in June... the 2200s look out of range until July. The 'old leader' saw the third consecutive net monthly decline, settling -3.4% @ 8299.. a full 1000pts below the Nov'2014 high of 9310. Underlying MACD cycle is now significantly negative, and bodes for further weakness this summer. Best case downside for the equity bears would be the lower monthly bollinger, which will be around 7K across the summer. The giant psy' level of 10K now looks out of range for many months. It has been an interesting month, but I do expect increasingly dynamic price action across the summer/early autumn. There clearly remains a high threat of a GREXIT, and on any basis, that would surely give the market an excuse to sell lower... if only briefly. Thanks to all those who said hello this month... it makes all the difference! 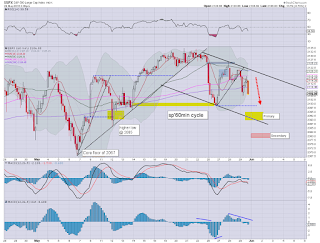 US equity indexes ended the month on a moderately negative note, sp -13pts @ 2107 (intra low 2104). The two leaders - Trans/R2K, settled lower by -0.8% and -0.5% respectively. Near term outlook is for further weakness next week to around 2080. From there, renewed upside to 2160/80 zone in mid/late June. 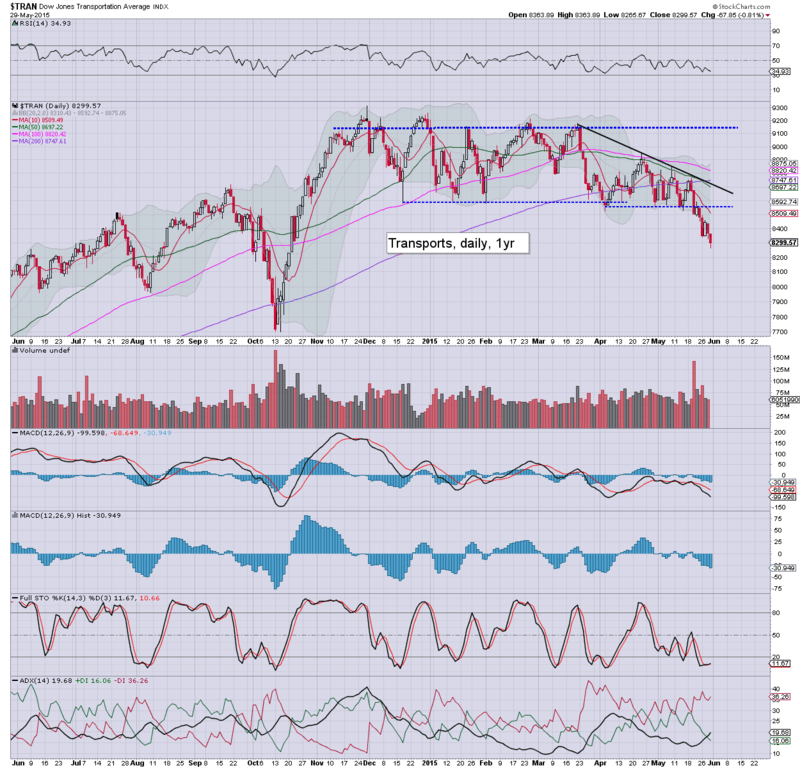 *Trans remains the notable laggard, with a new cycle low in the 8200s.. a clear 1000pts below the Nov'2014 high. Not much to add. Price action for the broader market was a little choppy this week, with an low on Tuesday of sp'2099. Certainly, the Friday close was bearish, and does offer a fairly high probability of further downside in the first half of next week. However, with the 200dma now at sp'2041, the equity bears face huge support in the 2040/00 zone. 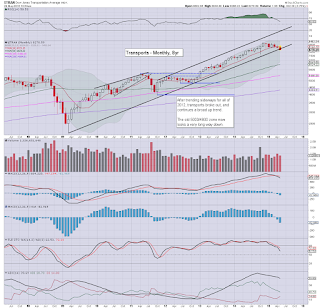 Sustained action under the giant 2K threshold looks out of range for at least another month or two. 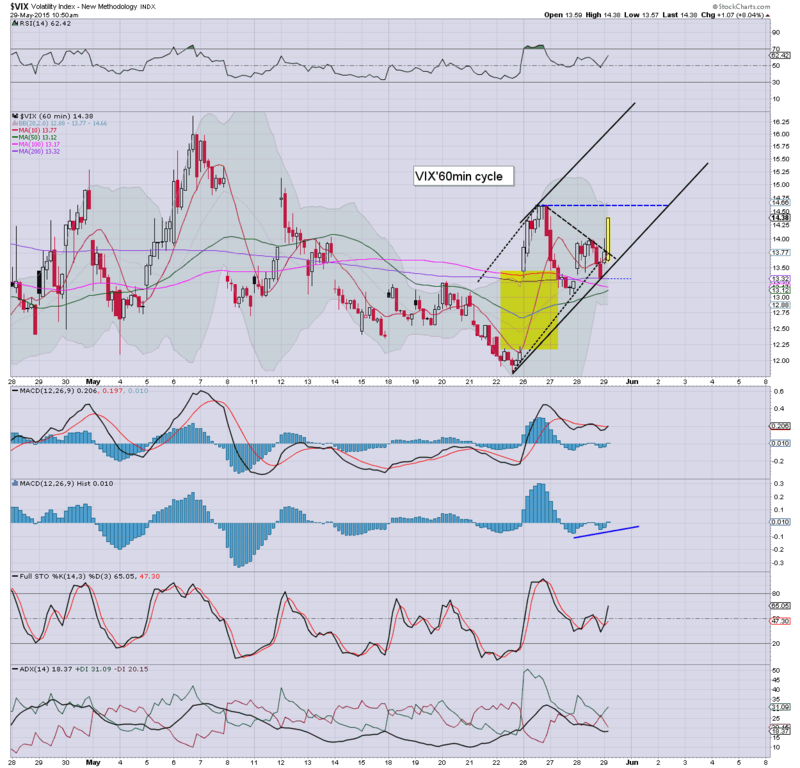 With equities falling into the May close, the VIX battled higher, settling +4.0% @ 13.84 (intra high 14.43). 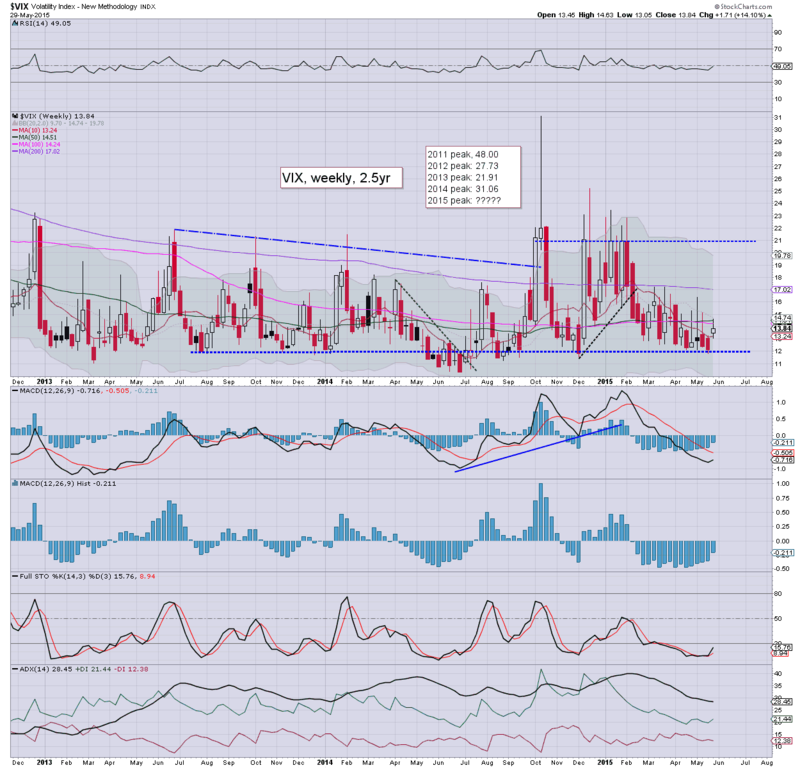 The VIX saw a net weekly gain of 14.1%. 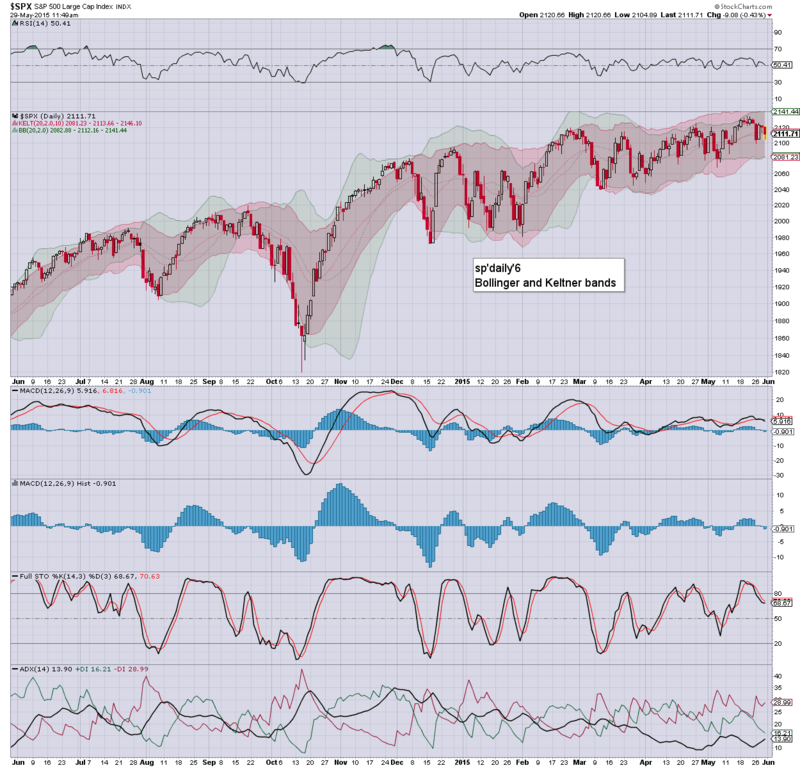 Near term outlook offers further equity weakness to the sp'2080s, which should equate to VIX 16s. Suffice to add... the VIX climbed 3 days of this shortened 4 day week. 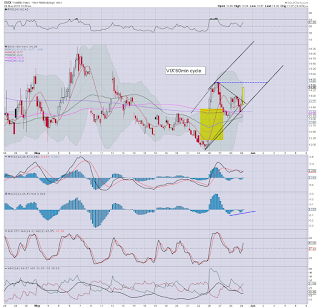 VIX 15/16s look due next week, if sp'2080s... but from there.. the equity market looks due another up wave into the next FOMC of June 17'th. 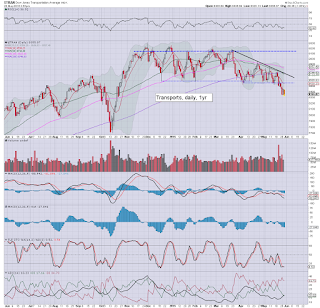 By then.. we could be looking at sp'2160/80 zone... which would certainly equate to VIX back in the 11s.. perhaps even 10s. *a naturally choppy closing hour, and it bodes in favour of the equity bears next Monday. ... and another week.. and month comes to a close. 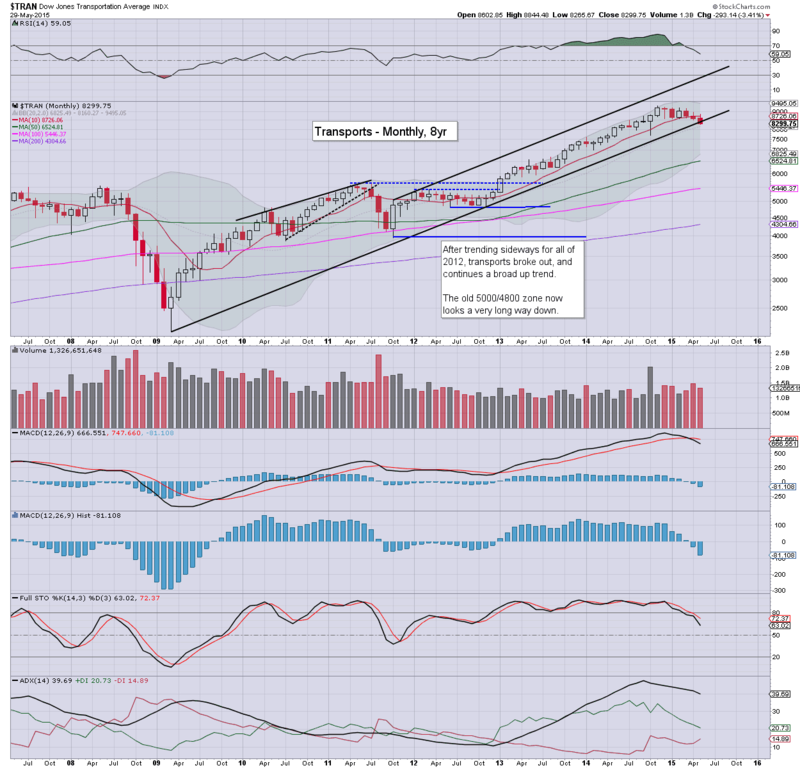 Without question, it was a month for the equity bulls, with net monthly gains for most indexes, along with a set of new historic highs in some, but most certainly, not all indexes. *the usual bits and pieces across the evening... to wrap up the trading week. 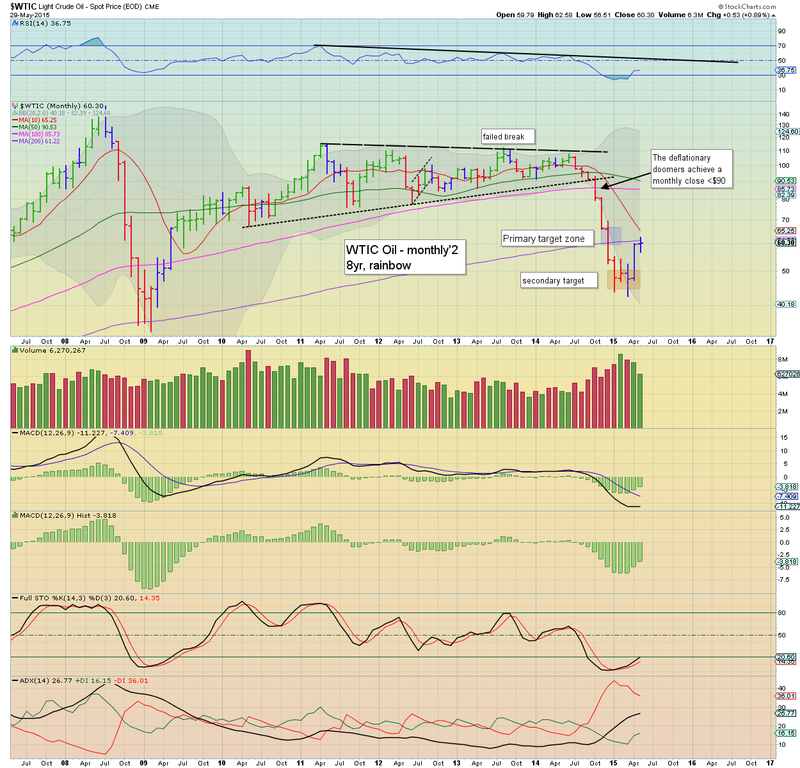 The micro bear flag is playing out, with US equities set to fall into the monthly close. Regardless of the exact close though, it has been a month for the equity bulls, with net monthly gains for most indexes, along with some new historic index highs. 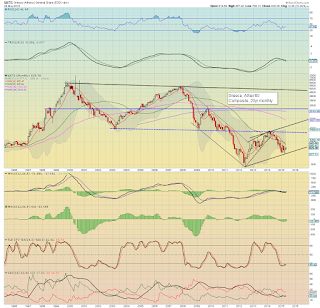 *as ever.. for the chart technicians.. the monthly closes will be rather important.. including the USD, precious metals, and Oil. Well.. its nice to see another bear flag play out as expected. The only issue now is how many of the rats will want to bail into the weekend. I'd guess.. at least enough to offer a chance to settle under the sp'2100 threshold. 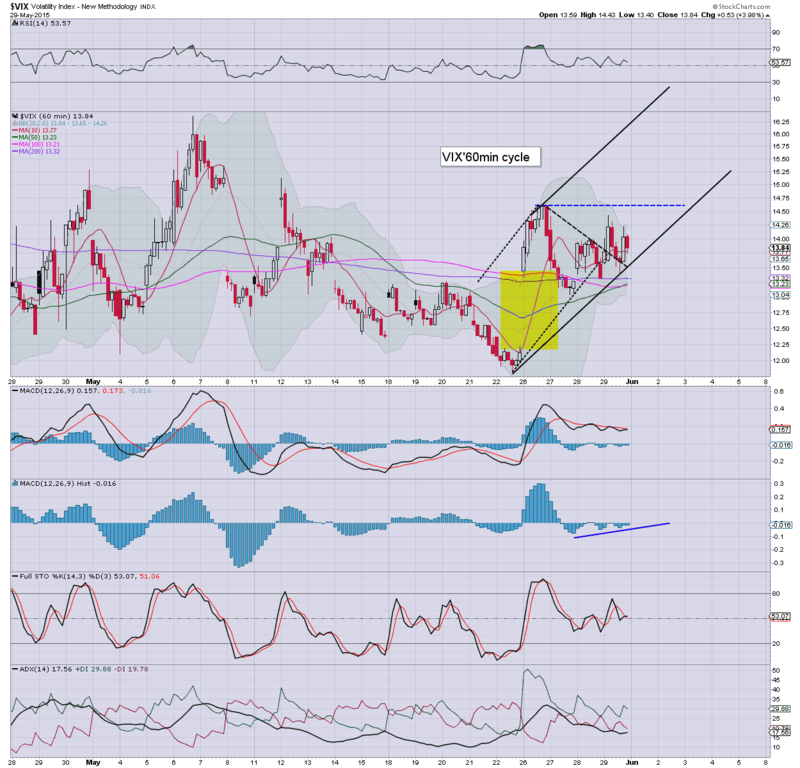 3.06pm.. sp'2107... VIX 14.10.... still potential for further weakness into the close.. as the rats will surely want OUT. 3.15pm.. Its getting a little choppy.. but then its end month... sp'2111... still looking for further weakness into the close. 3.36pm... chop chop.. sp'2110... VIX 13.80s.... STILL seeking weakness into the close. notable weakness, copper miners, FCX -2%, TCK -4%.... Copper itself is net lower on the month... it bodes badly for Gold/Silver this summer. 3.49pm.. end month chop... confusing many... but still... we're closing moderately weak. back at the close ! US equity indexes remain moderately weak, and look highly vulnerable to weakness for the remaining two trading hours of May. Price structure is a bear flag on the micro 5/15min equity cycles. USD remains a touch weak, -0.1% in the DXY 96.80s. *note the lower bollinger on the daily cycle... offering the low 2080s early next week. I realise some will be calling for new highs from the earlier floor of sp'2104, but broader upside looks unlikely until the Greeks come to an agreement later next week. As ever though.. any agreement will merely kick the can for another few months.. if not just weeks. It should be clear to most now that Greece will initiate some kind of exit.. .whether a partial debt default.. and/or an outright switch back to the Drachma. *Oil is holding powerful gains of 4.3%. 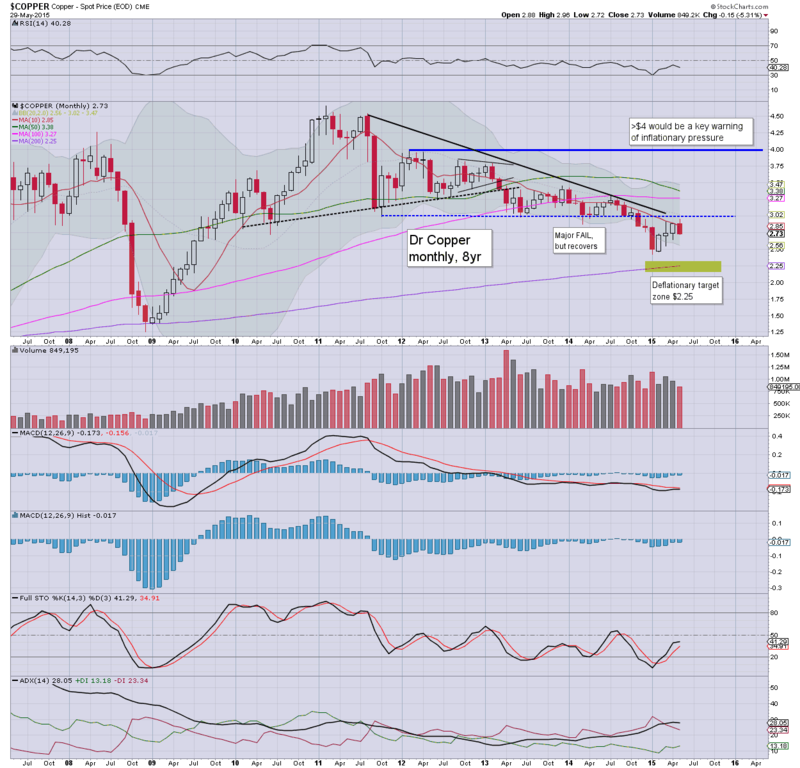 There is the bi-annual meeting of OPEC next Friday June 5th... it would seem likely supply will NOT be cut, with WTIC Oil having ramped from the March low of $42s to the current $60. There looks to be upside to 65/67 by late June/early June. 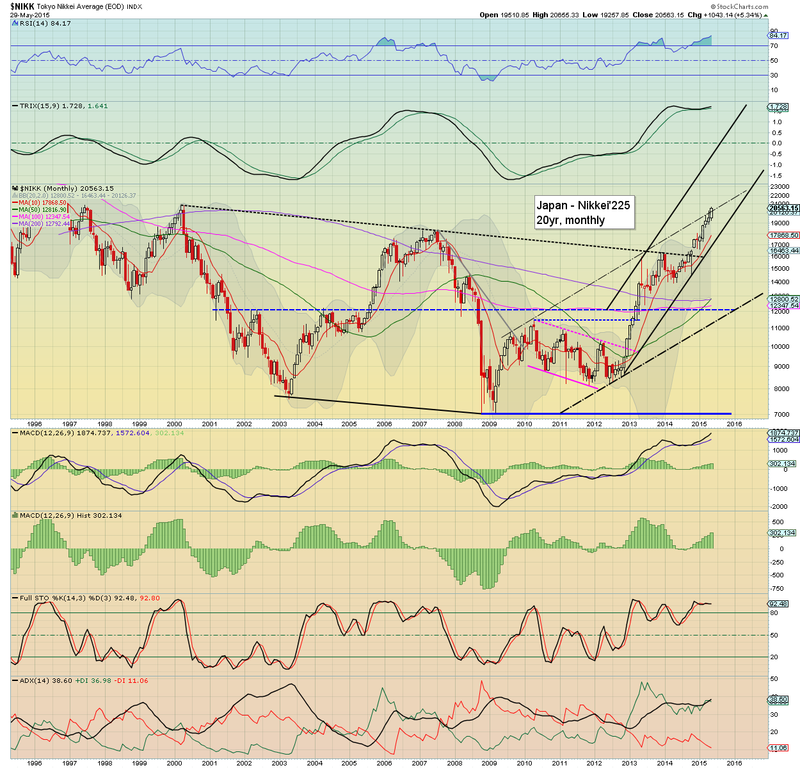 Sustained price action in the $70s looks VERY unlikely for the rest of this year. 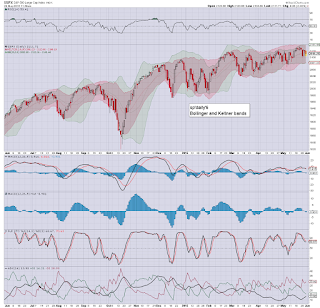 The sp'500 has seen a moderate ramp from 2104 to 2115... along with a VIX that has cooled back into the mid 13s. Broadly though, market looks set for some latter day weakness. USD appears floored, and looks set to close in the DXY 97s... which will put some downward pressure on most asset classes into the monthly close. *not surprisingly, the Trans remains the weakest index today.. having made another new cycle low in the 8200s. So.. an 11pt bounce to 2115... no doubt that has probably shaken out a fair few of the day-trading bears. 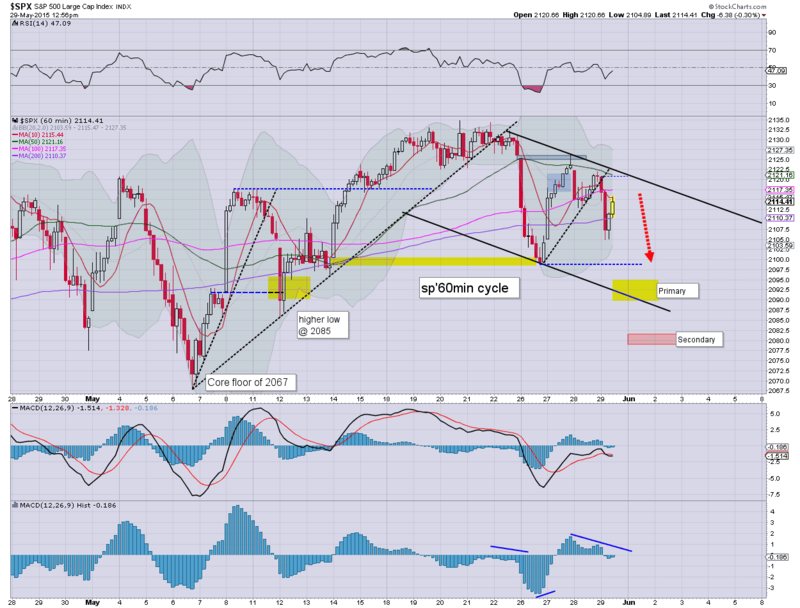 All things considered though, the market looks set for renewed weakness into the close. There is little reason why at least some of the rats won't be bailing ahead of the weekend. 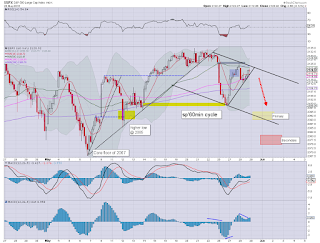 US equities remain weak ahead of what will surely be another Greek can kick next week. Best guess... sp'2090/80 zone early next week - along with VIX 16s.. before another wave higher into mid June. 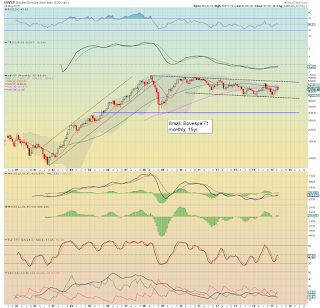 A tag of the upper weekly/monthly bollinger (2160/80 zone) still seems probable.. before an intermediate top. So.. it remains a reasonably good day for the bears... although still net monthly gains for most indexes. 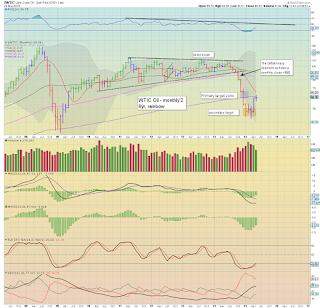 A daily/monthly close <sp'2100 - along with VIX 15s looks very viable today. There is ZERO reason why anyone should be bullish into the weekend. 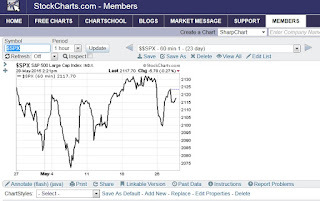 With a set of lousy econ-data, the market is under increasing pressure. The hourly equity cycle is offering downside into the monthly close, lower trend is offering 2090/88.. today, along with VIX 16s. USD remains fractionally lower in the DXY 96.90s. It is turning into a rather interesting day. *anyone notice how Q1 GDP was actually trending on Twitter? 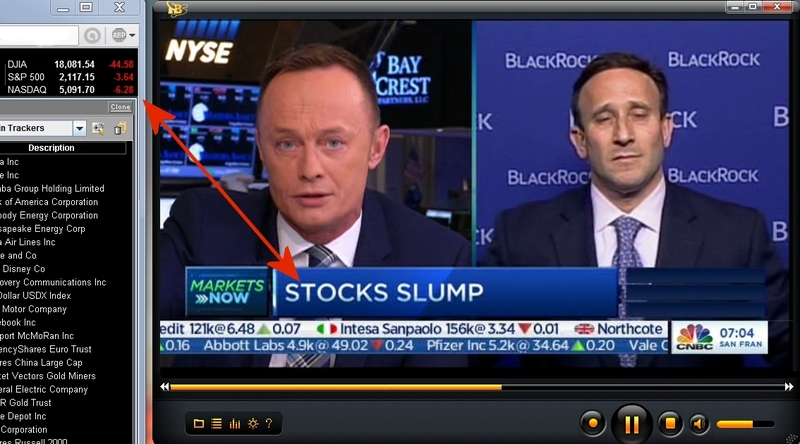 Mainstream is getting a little rattled at what are multiple recessionary data points. Hourly MACD equity cycle is in the process of turning negative, and should remain so into next Monday. notable weakness: Alcoa (AA) -1.7% @ $12.46... on its way to 10/9 by the late summer. A hit of the low monthly bol.. around 7K this summer.. or autumn (makes little difference) would open the door to ultimate bearish outlook. Oil is holding sig' gains of around 2%.. and that is helping the market.. with most energy stocks higher. Eyes to the USD... if Euro sees some weakness later today.. higher USD.. with commodities to be pressured lower. USD has turned positive, +0.1%... that is starting to pressure the precious metals a little. US equities have once again opened moderately weak, as both revised Q1 GDP (-0.7%) and the Chicago PMI (46.2) are of a recessionary nature. USD remains in cooling mode, -0.1% in the DXY 96.80s. Metals are holding minor gains, Gold +$3, with Silver +0.4%. *the Chicago PMI of 46.2 is truly DIRE, and bodes badly for Q2 GDP. Hourly MACD (blue bar histogram) is set to turn negative by late morning... with viable downside into early Monday. Considering the econ-data.. and the current price action.. market looks set to fall across the day. 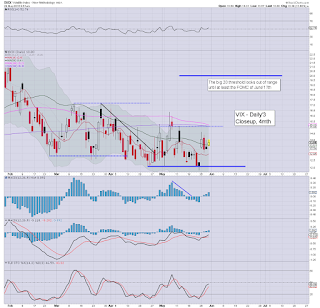 The fact VIX h as already broken into the 14s is an extra sign things are swinging back toward the bears. Transports is -0.6% in the 8200s... nothing bullish there. Arguably.. the only thing that could wreck today would be some more talk of a Greek 'kick the can' deal. 10.01am.. consumer sent... 90s.. vs prev. 95. May is not turning out to be so great. Clown finance TV getting upset over sp -3pts? Who is writing those headlines? 10.10am.. Unless the bull maniacs can get a positive Greek headline within the next 30/90mins... we'll be trading around sp'2100 by this afternoon. 10.45am.. sp'2109.. with VIX pushing upward... 14.15, a daily close in the 15s looks due. Good morning. 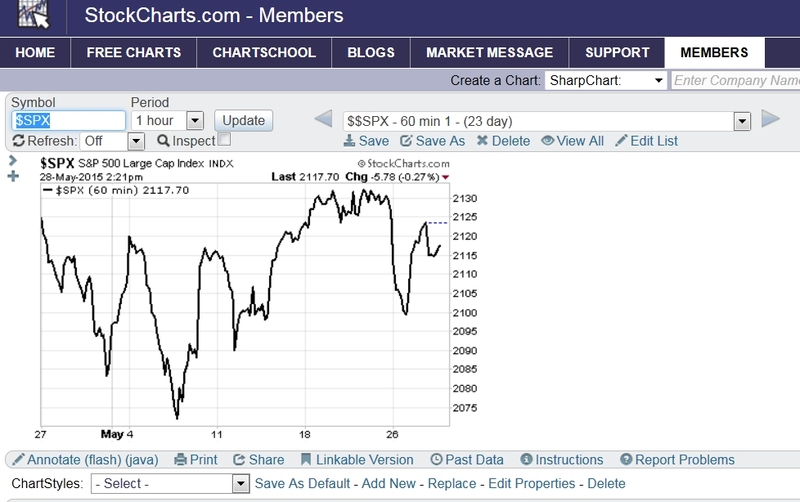 Futures are largely flat (ahead of GDP data), we're set to open at sp'2120. USD is fractionally lower @ DXY 96.90s. Metals are broadly flat. Oil has early gains of 1.2%. *futures were sp -9pts at one point, but with more Greek chatter... jumped back to evens. Equity bears should keep in mind that even if somehow the market closes significantly lower today by 1%, most indexes would still settle May with a net gain. ...awaiting GDP and PMI data.... should give prices a kick... one way or the other. 8.30am Q1 GDP (first rev): -0.7%... not pretty.... broadly inline with market exp. USD has turned fractionally positive. 8.39am... sp -3pts... 2117. Bears just need to break -0.5% lower to build enough downside momentum to cause some problems into the weekly close. As ever, its a case of how many of the rats might want to bail ahead of the weekend. 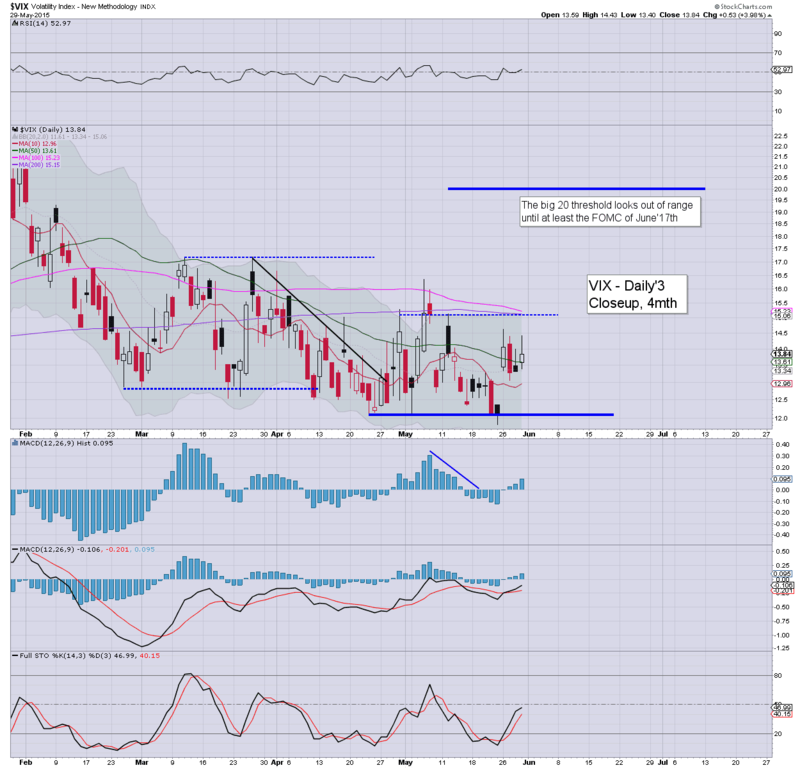 .. eyes to the VIX... looking for a break into the 14s. China maxed out at 5K ? Whilst the US market saw a day of moderate weakness, the more dynamic action was in China, having seen a natural bearish reaction from the giant psy' level of 5K. 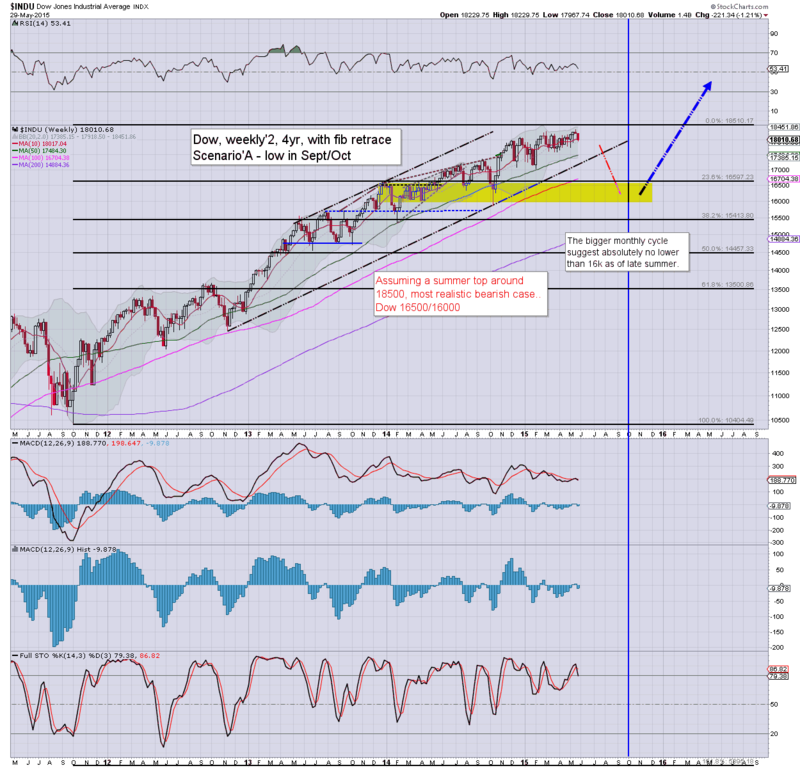 The net daily decline of -6.5% to 4620 (intra high 4986) was certainly severe, but such pull backs are to be expected. The Thursday session for China certainly merits a mention. Having hit a new 7yr high of 4986, the market saw an initial rejection.. a few hours of churn.. but then a sharp closing hour sell down, with a net daily decline of -6.5% @ 4620. Such severe daily declines are to be expected, with the Shanghai comp' having seen a hyper-ramp from last summer. Has China maxed out at 5K? Short term... that could very well be the case. Indeed, with the break above 3400 the natural target has always been 5K.. rather than 4K... or 6K. 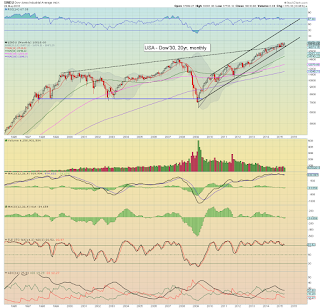 A full retrace to the key breakout level of the 3400s is viable at any point this summer. However, on the bigger time frame, new historic highs >6124 look a given - whether late this year.. or in 2016. A net monthly gain looks a given, even if there is sig' weakness on Friday. Considering the recent new historic high of 2134, the equity bears have nothing to tout right now. The broader trend remains intact. Friday will see GDP (first rev), market is expecting a downward revision to -0.8% from +0.2%. It would be pitifully ironic if the market ramps on a 'better than expected' negative GDP number tomorrow. Data also due: Chicago PMI, market expects a non-recessionary 53.1. Anything under 52 would likely spook the market, and be a renewed warning about Q2 GDP. US equities closed moderately weak, sp -2pts @ 2120 (intra low 2112). The two leaders - Trans/R2K, settled -0.9% and -0.1% respectively. Near term outlook is increasingly uncertain. 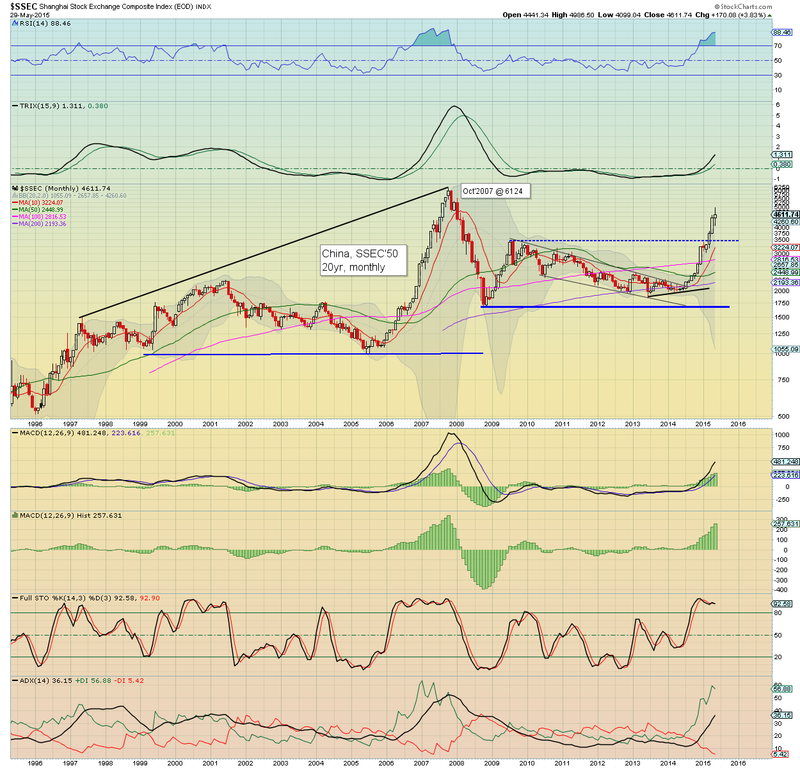 If the USD has maxed out in the DXY 97s, then renewed equity upside will be likely across June.. and probably into July. Suffice to add, despite the continuing significant weakness in the 'old leader' - Transports, the broader market is holding together very well. Equity indexes saw moderate weakness across the day, but it was not enough to push the VIX into the 14s (intra high 13.99), settling +0.3% @ 13.31. Near term outlook is uncertain, and will be largely dependent upon whether the USD will cool into June/July.. or break back above the giant DXY 100 threshold. 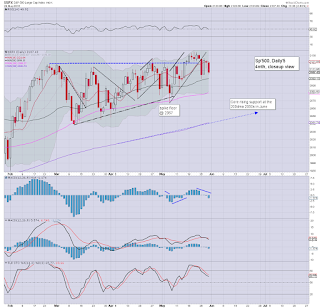 *a daily black-fail candle.. with a bearish spike, it certainly bodes more in favour to the equity bulls. A day of major disappointment for the equity bears, as entirely reflected in the VIX. 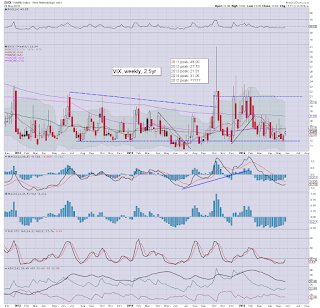 The big VIX 20 threshold looks out of range for some weeks. 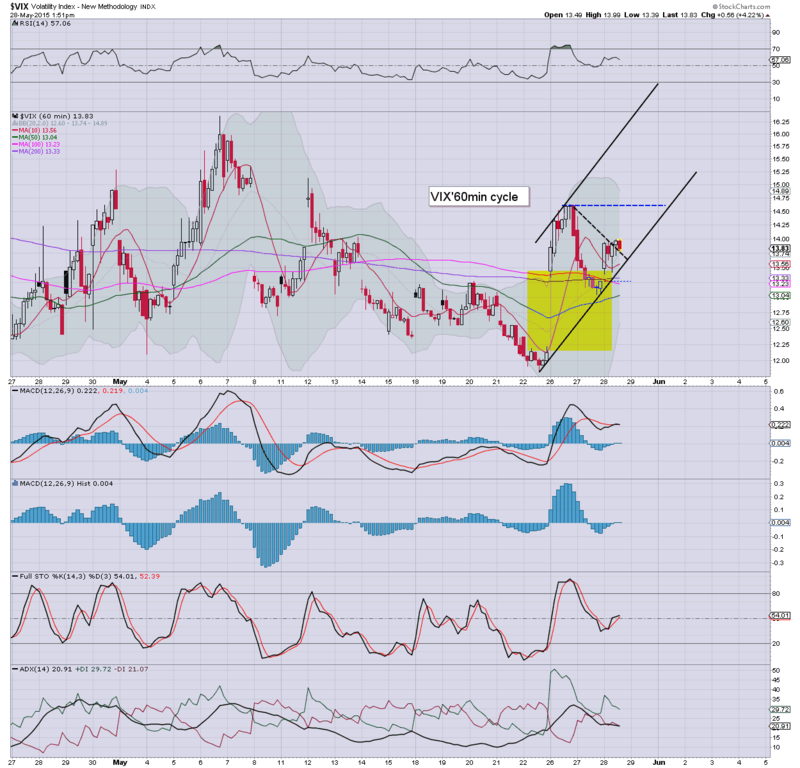 If the USD cools across June/July, equities will battle upward, and the notion of VIX 20s can be dropped until Aug/Sept. *a closing hour of very minor chop, absolutely nothing for the bears to be pleased about. A day when the equity bears failed to show any real downside power... as reflected in a VIX that was unable to break into the 14s. The transports remains exceptionally weak, but as ever.. it is just one index.. and the broader market remains well within its primary upward trend. For the equity bears, it has been a tiresome Thursday, as most indexes are now battling to turn positive by the close. 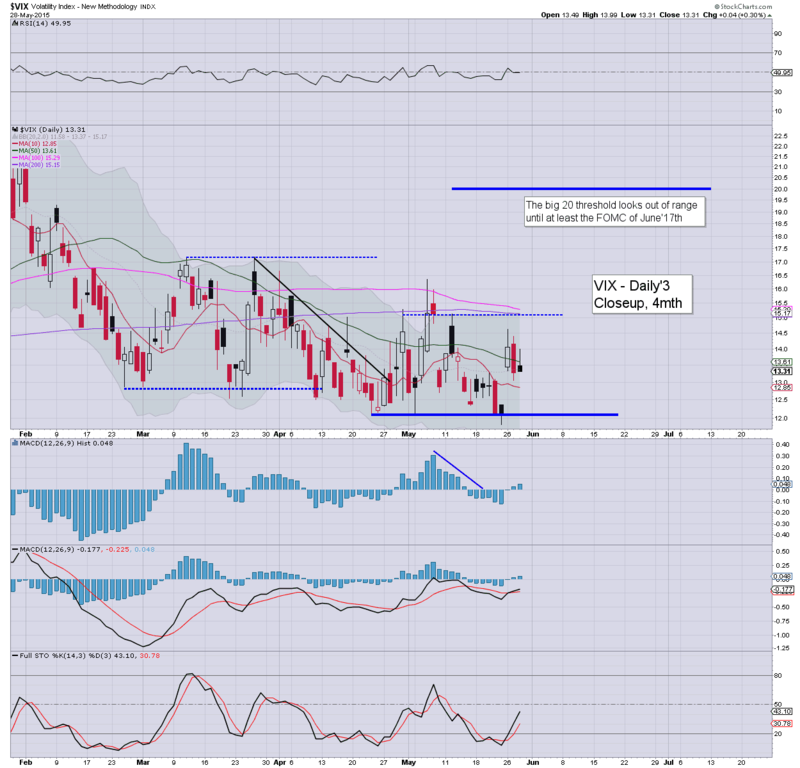 VIX is failing to show any upside power, and is now vulnerable to a red close. USD remains in cooling mode, -0.4% @ DXY 97. Gold +$2. Oil has turned positive, swinging from -2% to +0.2%. *Transports remains significantly weak, but certainly... the broader market isn't following. 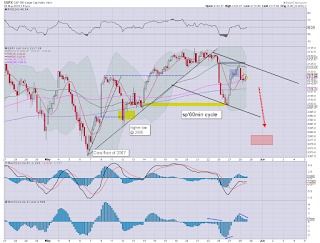 A failed down wave, any move above sp'2123/24 would negate what hope there is for the bears. 3.38pm.. The chop continues... price structure is still a bear flag (just)... but really... it'd seem everything is now dependent on how the market interprets tomorrow's econ-data.. along with overnight Asian markets. 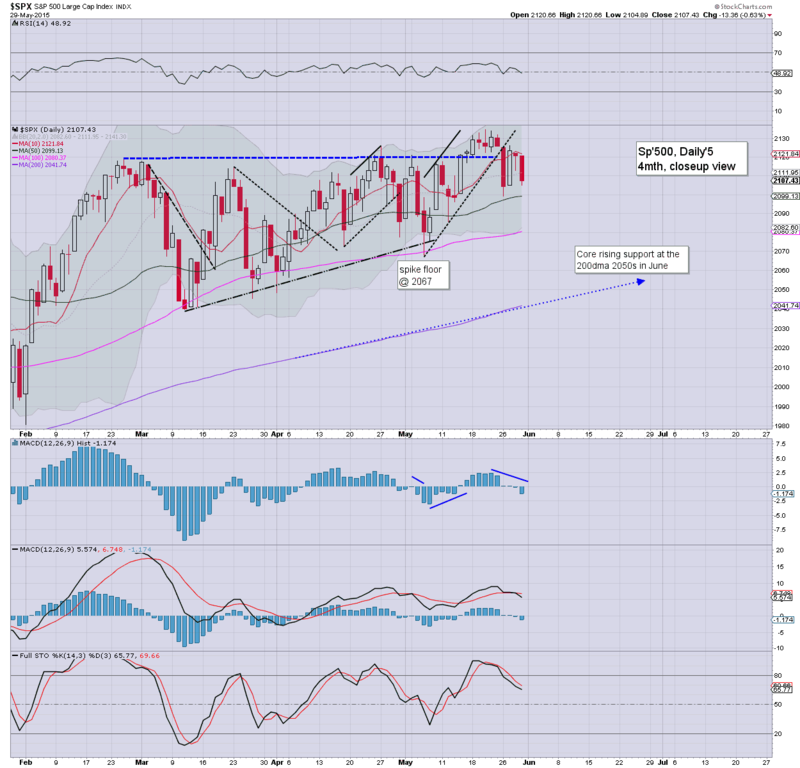 2pm update - bear flag or higher low? 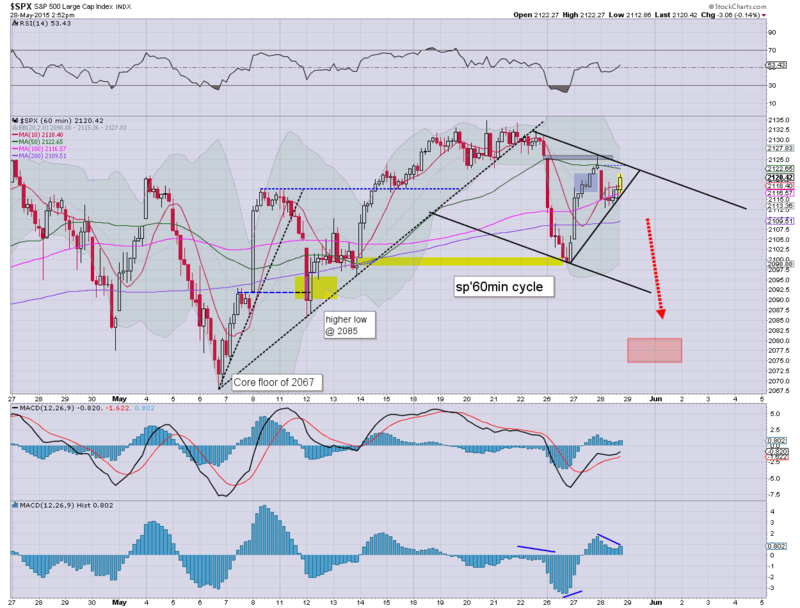 US equities remain moderately weak, sp -6pts @ 2117. Price structure is offering a bear flag, but it could certainly also be deemed a higher low from 2099. USD is in cooling mode, -0.3% @ 97.00s. Metals are a touch higher, Gold +$2, whilst Oil is -0.7%.. but well above the earlier low. It is getting somewhat tiresome in market land. 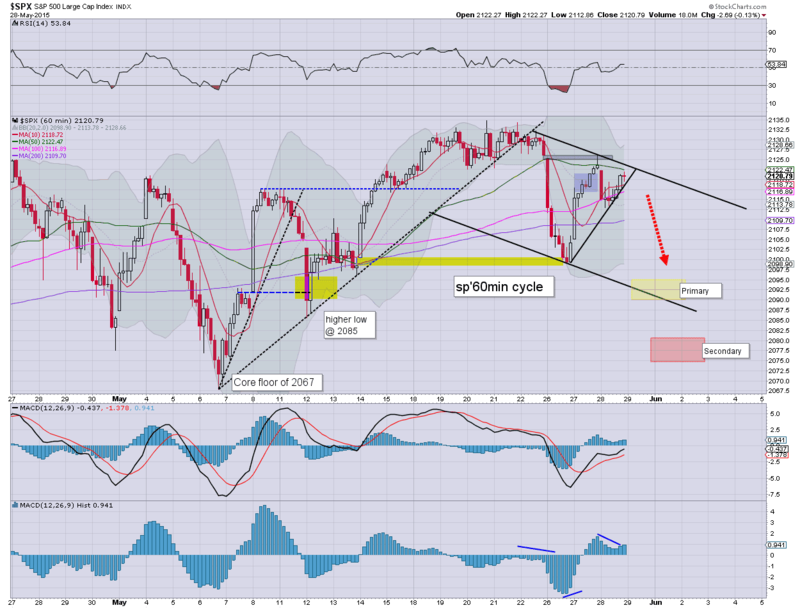 Price action is increasingly choppy... if a touch on the weak side. Worse case for the bears... some nonsense excuse tomorrow morning.. and we'll close the month close/at new highs (at least for sp'500). Best case... overnight Asia weakness.. and lousy Friday morning (GDP/PMI) econ-data...with a break back under sp'2100.. opening the door to a move to 2080/75. My guess? Daily cycles are bearish.... and the Transports certainly supports that view. Urghh. Someone had better reboot the server.